Combination of passive USB HUB with Gigabit Ethernet adapter, for easy and fast connection of your favorite USB peripherals to your laptop, tablet, PC with new USB-C or Thunderbolt 3 interface, and for fast network and Internet access with Gigabit Ethernet connection. The HUB offers one USB 3.0 port with the Plug & Play function and standard USB charging â€“ it will automatically detect connected equipment for USB charging. The USB 3.0 interface is important mainly for data transfers from USB 3.0 memory cards and flash disks which will use its high transfer speed most. The Gigabit Ethernet port allows you easy access to 10/100/1000 Mbps network. You can enjoy high speed internet access without any interruption. This HUB is powered from the USB bus and it has a built in overcurrent protection of your computer in case of short connection on the peripheries. It supports a wide range of operating systems from Windows and Mac OS to Linux. Ethernet network connection can also be used in the Android system. However, the support of this function must be included by the manufacturer directly in the particular Android device. You can easily check this support in Network Connection Settings â†’ Other Networks, which must include Ethernet. 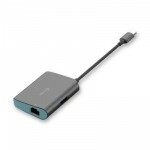 The HUB is suitable for use with MacBook Pro 2016, MacBook 2015, Chromebook Pixel 2015, Acer Switch Alpha 12, Dell XPS 13, HP EliteBook Folio G1, ASUS UX390UAK and other devices with the USB-C connector. The USB-C connector has many advantages, it is smaller, symmetrical and allows easy connection, because now you donâ€™t have to worry about the rotation of the connector. More information about the USB-C is available here.